That question is merely one phase of the most important question that is now facing the church— the question of Christianity and culture. The modern world is dominated by a type of thought that is either contradictory to Christianity or else out of vital connection with Christianity. This type of thought applied directly to the Bible has resulted in the naturalistic view of the biblical history—the view that rejects the supernatural not merely in the Old Testament narratives, but also in the Gospel account of the life of Jesus. According to such a view the Bible is valuable because it teaches certain ideas about God and his relations to the world, because it teaches by symbols and example, as well as by formal presentation, certain great principles that have always been true. According to the supernaturalistic view, on the other hand, the Bible contains not merely a presentation of something that was always true, but also a record of something that happened—namely, the redemptive work of Jesus Christ. If this latter view be correct, then the Bible is unique; it is not merely one of the sources of the preacher’s inspiration, but the very sum and substance of what he has to say. But, if so, then whatever else the preacher need not know, he must know the Bible; he must know it at first hand, and be able to interpret and defend it. Especially while doubt remains in the world as to the great central question, who more properly than the ministers should engage in the work of resolving such doubt—by intellectual instruction even more than by argument? The work cannot be turned over to a few professors whose work is of interest only to themselves, but must be undertaken energetically by spiritually minded men throughout the church. But obviously this work can be undertaken to best advantage only by those who have an important prerequisite for the study in a knowledge of the original languages upon which a large part of the discussion is based. I am not sure how much Greek a Pastor needs to know today? With today’s many great translations, is it really necessary for a pastor to be an expert in the Greek language? I taught myself how to read Greek somewhat (like 3rd grade level). I can recognize words, and what not, but honestly with the many Greek tools that I have at my disposal, commentaries, and various bible translations, I am not sure that I need to become a Greek expert. One has to prioritize, being a working pastor I don’t have the time to focus on being a Greek expert. I think that there are those that do need to become experts in the Greek language especially those that are translators, commentators, and teachers. But today for most pastors, with all of the tools available I am not sure that is true today. Just read “Greek for the Rest of us” by William Mounce, I think he understands the need. Anyhow, just thought I add my two cents. This reminds me of the recent post over at the lively Energetic Procession blog, in which was discussed the Florentine union council and the competing Eastern/Western interpretations of 1Cor3, “saved though as through fire.” The Greeks seemed to really score a point with the Latins by bringing up the fact that Chrysostom’s interpretation holds out, not merely because he’s Chrysostom (great Ecumenical Teacher and Hierarch) but because he was a native speaker. The one example from the fathers for their own (mis)understanding of the passage came from St. Augustine– not quite a Grecophile. The whole exchange made me glad that the Greeks were at that time the “pitbulls” of the Church! While I don't feel everyone needs to be an expert, I do feel a functional understanding of Greek & Hebrew is very important for pastors and Bible teachers. Machen has always had a warm place in my heart, because my first experience with Greek was in the context of his Greek grammar. I agree with Machen – I learned the rudiments of NT Greek from his Grammar. Thanks for this, Esteban. 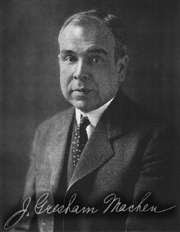 I once read an article by Machen and was so impressed by his prose that I went out and bought two of his books. But to this day I haven’t found time to read them! The modern conception of the purpose of education is that education is merely intended to enable a man to live, but not to give him those things in life that make life worth living. This describes the present attitude of the British government to higher education, which I consider to be a form of facism. It is also the underlying assumption of the PISA study, which has evaluated the education systems of all countries according to utilitarian criteria. Germany, having suffered the consequences of facism, has invested a lot of thought and energy into creating an education system that teaches people to be critical and think for themselves. Theology, for example, is a respected subject in the broader economy. Needless to say, they scored low on the PISA scale, which is causing some states to consider restructuring the system. A language cannot easily be learned by the eye alone. Which is why I try to get recordings as much as possible. I’m delighted that Logos has now created a kareoke style audio CD of the New Testament. Once I finally finished dragging my way through J. Wenham’s text book and start reading the Gospel of John I hope to purchase it and integrate it into my daily reading. And the Hebrew OT? He pays lip-service to Hebrew in the second paragraph, but it doesn’t appear again as something of equal value to Greek or NT. Is that right? Oh, and one other thing I don’t agree with: learning Greek is a nightmare! There is actually a book by the same name of this article by A.T. Robertson. I believe every Greek student should read this book. The challenge is always there when you go back and read it. The same holds true with those who are proficient in Hebrew and/Aramaic. Although Machen and Robertson were specialists in their field, the Old Testament need not and should not be neglected. Rick> I was unaware of that book by A. T. Robertson, but I’ll look it up. Thanks for the tip!